Maintaining healthy, beautiful skin often requires more than an excellent skincare regimen and careful avoidance of UV rays. While those are important factors, aging, fatigue, pollution, environmental effects, and genetic predisposition can also contribute to dull, blemished skin. We offer advanced laser treatments such as the original Clear + Brilliant and the Clear + Brilliant Perméa fractional lasers for patients seeking to minimize early signs of aging and sun damage. They can also help protect skin against the development of wrinkles and other skin conditions. Dr. Eugenie Brunner, our experienced facial plastic surgeon, tailors treatment plans to address the unique concerns and desired results of each individual, helping to provide radiant, youthful-looking skin without surgery. For more information about our state-of-the-art Clear + Brilliant fractional laser treatments, or if you wish to schedule a consultation with Dr. Brunner, please contact our office today. What is Clear + Brilliant® laser treatment? Clear + Brilliant is an innovative laser technology that is designed to gently and effectively improve skin tone and texture with beautiful results. This laser is customized to suit your unique needs and delivers targeted energy to provide comprehensive cosmetic enhancement. Clear + Brilliant works alongside your skincare regimen to help slow the aging process and its effects, often before they begin to show or just as they are starting to reveal themselves. Designed to be gentle on the skin, the Clear + Brilliant family of lasers can be used to prevent early signs of aging and minimize fine lines, mild sun damage, and the loss of radiance that may have already started to occur. Additionally, laser treatments from our practice can enhance the skin’s luminosity and permeability for increased absorption of beneficial skincare products. The Clear + Brilliant Perméa laser is specifically created to work in combination with a topical regimen, typically providing more comprehensive and long-lasting results. The procedure works by targeting areas of concern on a microscopic level. Once administered, the laser immediately begins to smooth skin texture and even tone while stimulating the body’s production of collagen for aesthetic improvement that should continue for weeks and potentially even months after treatment. 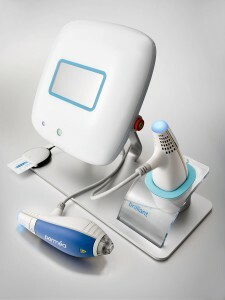 Patients utilizing the original Clear + Brilliant laser will have a topical anesthetic applied to the areas to be treated to enhance comfort. Most individuals describe the experience as a warm, prickling sensation on the skin. Patients receiving the Clear + Brilliant Perméa treatments usually do not require a topical anesthetic, although an antioxidant serum will be applied after the procedure to help minimize the potential for redness and swelling. 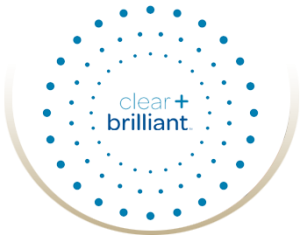 Who is a good candidate for Clear + Brilliant®? One of the many advantages of Clear + Brilliant is how it can work on a variety of skin tones and types. It works with skincare products to provide subtle but noticeable changes and to prevent the development of fine lines and other signs of aging. This treatment is not designed to provide dramatic rejuvenation–for that, Dr. Brunner can recommend another approach. Clear + Brilliant can help many patients, but it’s not right for everyone. If you have melasma, rosacea, or another skin disorder, Clear + Brilliant may not be right for you. You should also hold off on using retinoids (retinol, or Retin-A®) for about two weeks before your treatment. You should be in good general health, have reasonable expectations for the result, and desire fresher, more radiant, and smoother skin. If you have any questions, Dr. Brunner will discuss your options and address your concerns at your initial consultation. One of the best features of the Clear + Brilliant laser is the ability to provide both immediate and long-term results with minimal downtime and few side effects. After the initial treatment, patients can begin to see improvement in skin tone, texture, and brightness within a few days. Each additional session typically offers significant visible enhancement that may last for months, depending on the individual’s skin condition, skincare regimen, and age. Some redness and swelling following the procedure is normal and should fade within a few hours; however, in comes cases these effects may last until the next day. As a precautionary measure, Dr. Brunner encourages everyone to utilize sun protection, especially a good quality sunscreen, to help protect the skin. While beneficial results can often be seen after one Clear + Brilliant laser session, Dr. Brunner generally recommends a series of treatments to help optimize the outcome. During the initial consultation, she will develop a customized treatment plan that is tailored to each patient’s unique needs and expressed goals. Clear + Brilliant laser therapy typically lasts about 20 minutes, though individuals should plan for the entire experience to take approximately one hour. This state-of-the-art technology is not designed for people who have moderate to severe sun damage or deep wrinkles; however, it can be one of the safest and most effective options for reducing and preventing early signs of aging and enhancing a youthful radiance. How much does Clear + Brilliant® cost? We tailor each patient’s treatment plan to suit their unique needs and goals. As a result, your Clear + Brilliant procedure could vary in cost from someone else’s. The price of Clear + Brilliant also depends on how many sessions you receive, as most individuals have several and may continue to have occasional “touch up” treatments over time. During your initial consultation, our medical team will review the anticipated cost of your program so you are well-informed. We also offer several payment options, including medical financing, to help you bring Clear + Brilliant expenses into your budget. Talk to us about any questions you may have, and we will work hard to help you find a solution.